Let's get this out of the way -- there is absolutely no evidence that Russia is withdrawing from Syria. In fact, despite the Russian government's claims and the Western media's coverage of the story, evidence suggests that the opposite is true. Furthermore, this has happened before -- in March of 2016 Russian claimed it was drawing down its Syria presence, evidence suggested that they were in fact doubling down there, and the Russian claims were amplified by an uncritical Western media. Let's start with today's claims. CNN is running the headline "Russia 'starts to withdraw' forces from Syria." Russia has started to cut back its forces in Syria, beginning with an aircraft carrier group, Russian state news agency TASS reported Friday. Warships led by Russia's sole aircraft carrier, Admiral Kuznetsov, will be the first to leave the conflict area, the chief of the Russian Armed Forces General Staff, Gen. Valery Gerasimov, is quoted as saying. It is not clear if the Kuznetsov's warplanes will leave with it or if any will stay behind in Latakia, Syria. The reported initial withdrawal of forces come as a nationwide ceasefire -- negotiated between Russia, Turkey and the Syrian government as well as Iran and Syrian rebel groups late last year -- largely holds across the country, according to the United Nations. The problem is that almost all of this is not true. Nowhere in the report does it mention that Russia's aircraft carrier is largely useless and has flown very few combat operations according to experts who have monitored the situation. The report does not mention Russia's previous "withdrawal." It does not mention that every Syrian ceasefire has ended by a strategic repositioning of pro-Assad forces, followed by a fresh offensive. The CNN report does not mention that the same pattern appears to be playing out again today. Over the last several days, Russian cargo ships have been spotted moving toward Syria. These military transports have been so full of equipment that military vehicles are parked on the decks. A Syria expert has an even more alarming report -- that new satellite images show that Russia has deployed Iskander ballistic missiles -- capable of firing a variety of warheads, including nuclear weapons, to Lattakia. This would enable Russia to fire warheads anywhere in Syria, but it could also hit targets in the southern half of Turkey, Israel, Jordan, and parts of Saudi Arabia and Egypt. However, we should note that according to IHS Jane's, the Iksander has been deployed in Syria since at least March of 2016. ANALYSIS Russia has deployed at least one Iskander missile system to its Humaymim Air Base in Syria, although it is unclear if it is the ballistic or cruise missile variant. The Iskander transporter erector launcher (TEL) was spotted in footage broadcast by Russia's Zvezda TV channel on 27 March. Just yesterday, The Interpreter analyzed reports that three elite Russian paratroopers were killed in Syria. Again, one would not expect to see elite Russian units fighting on the front lines if it were preparing to withdraw from the country. Perhaps Russia's least effective weapon it has deployed since the end of the Cold War is the aircraft carrier Admiral Kuznetsov. The carrier is oil-fueled, making it expensive to operate, and is famous for the black smoke it emits while maneuvering. Furthermore, two aircraft have crashed while trying to land on the carrier in the last several months. In November a MiG-29K ran out of fuel while waiting for the Kuznetsov's crew to fix a broken arresting wire. In December, an Su-33 crashed while landing when an arresting wire broke. Remarkably, the MiG-29K/KUBs, better suited for bombing missions, are yet to be used in anger. Instead, the navy has relied on Sukhoi Su-33s also aboard the Kuznetsov. These were developed as interceptors and, while having an infrared search and track system (IRST) and laser rangefinder/target designator, do not carry precision guided air-ground munitions. On strike missions the aircraft can carry up to eight 500-kg bombs or RBK-500 cluster bombs or twenty-eight 250-kg bombs attached to single- or multiple-beam racks. Naval Su-33s struck the rebels with free-fall bombs using SVP-24-33 kit installed on the aircraft shortly before the carrier departed her home base, Severomorsk, for the Mediterranean. This subsystem is a derivative of the SVP-24 “specialized calculating subsystem” developed by the Gefest company for the Su-24M2 frontal bomber, the primary Russian type employed in Syria. It does trajectory calculations for cueing the pilot in using free-fall bombs. The Russian Air and Space Force (VKS) finds its accuracy adequate for the theater. Higher computing power and use of more advanced algorithms improves by up to five-fold the accuracy of Su-33 strikes using unguided weapons compared to the factory standard. After a few cruise missile launches and bombing raids on targets on the Syrian rebel-held province of Idlib in mid-November, the Russian navy task force in the northeastern Mediterranean remains largely inactive, contrary to expectations. Just before the strikes, the task force suffered the embarrassing loss of a MiG-29K on November 13. Furthermore, evidence suggests that many of the carrier's fighters have been operating not from the ship but from the russian air base in Lattakia province. If Russia needed to fly in additional jets, it could have done so without using the aircraft carrier. Why, then, did Russia deploy such a weapon to the Syrian theater if it's expensive and risky to operate and adds little or nothing to Russia's military capability? The deployment received international attention from the impressionable Western press, and that attention has acted to further dissuade international intervention in the Syrian crisis. Even if the Admiral Kuznetsov is removed from the Mediterranean by the Russian navy now it will have limited impact on Russia's mission on the ground. It could, however, save Russia some money and perhaps some headaches, and as a clearly-identifiable symbol of Russia's military intervention it will further promote the propaganda talking point that Russia is pulling back from Syria. The ceasefire in Syria which went into place in the last week of December -- brokered by Turkey and Russia -- has been broken. It has not garnered the kinds of international press attention that the siege of Aleppo received, but there are two offensives currently underway by the pro-Assad coalition, both of which have a large Russian role. North of Damascus, the pro-Assad coalition has launched a massive bombing campaign against what has become known as the Wadi Barada pocket. A notoriously-unreliable outlet that supposedly backs the Syrian opposition, the UK-based Syrian Observatory For Human Rights (SOHR), justified this bombing because, according to the SOHR, the rebel group Jabhat Fateh al-Sham (JFS), formerly the al-Qaeda-linked Jabhat al-Nusra, was operating in that area. The problem? JFS does not operate in Wadi Barada according to local civilian councils, local rebel groups, and JFS itself. Western media outlets like The Guardian carried SOHR's claims until they were debunked. Why would the SOHR, which is supposedly an activist news network, support the Assad regime's ceasefire violations? Sources who have spoken to The Interpreter have several theories, but regardless, the SOHR is consistently unreliable. Yet the Western media has relied on them heavily since 2011, despite the fact that there are much more credible and transparent sources of information from Syria. One of the main consequences of the Wadi Barada operation is that the water supply for millions of people living in Damascus and its suburbs has been seriously polluted, likely the result of an air strike on December 23. 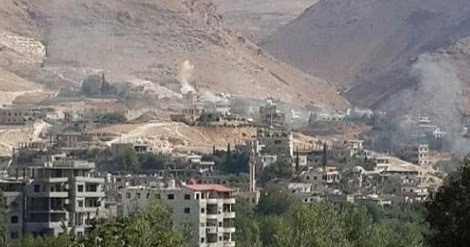 Activists report that the Russian airforce has played a major role in the bombing of Wadi Barada, and today pro-Assad news agencies are also bragging about Russia's role in the fight there. Meanwhile, in Idlib province, there are indications that the pro-Assad coalition that consists of the relatively-small remains of the Syrian military, Hezbollah militants, Iranian Islamic Revolutionary Guard Corps commandos, Iraqi Shi'ite militias, and Russian troops and paramilitary contractors, is preparing a fresh offensive against the heart of opposition-controlled Syria. A senior Syrian minister has warned that Damascus is preparing to send thousands of troops to Idlib region in the coming months in order to end the rebellion. The Syrian regime is preparing for "open battle" with rebels in northwest Idlib province, the minister for national reconciliation has said. Earlier in the week, the Storyful news agency was able to confirm that a Russian airstrike hit a residential neighborhood of Khan Sheikhoun, a city with a well-known anti-Assad protest movement. We are at the earliest phases of this "ceasefire," but we've seen this pattern before -- Russia and Assad only stop fighting enough to reposition their forces and launch a new attack. February -- Russia negotiates a "ceasefire," then strengthens Assad's positions near Aleppo. Live Updates: Yesterday a ceasefire agreement, drafted by Russia and the United States, was agreed upon by moderate rebel groups and the Assad regime. But is it just another ruse? We'll take a look at what Russia's bombing today to see how the patterns in Syria are changing. March -- Following the Russian victory in Palmyra (which is now back in the hands of the Islamic State) Russia announced a "withdrawal" and then deployed more troops to Syria, preparing for the assault on Aleppo. April -- a new Russian "ceasefire" applies to everywhere BUT Aleppo. This allowed Russia to ultimately break the backs of the Syrian rebels and begin the siege which resulted in the city falling to pro-Assad forces late last year. Now, following the Russian victory in Aleppo, Russia is preparing for new offensives, in Damascus and Idlib. Once again, however, the Western media appears to be taking Russia's claims at face value.